Binding a book is hard, but writing a tutorial is even harder! I had a request for a tutorial on how to bind a book like the one here. Here is an attempt at explaining how I did it. I did Google “how to bind a book” and came up with several alternatives, mostly with a glued spine. 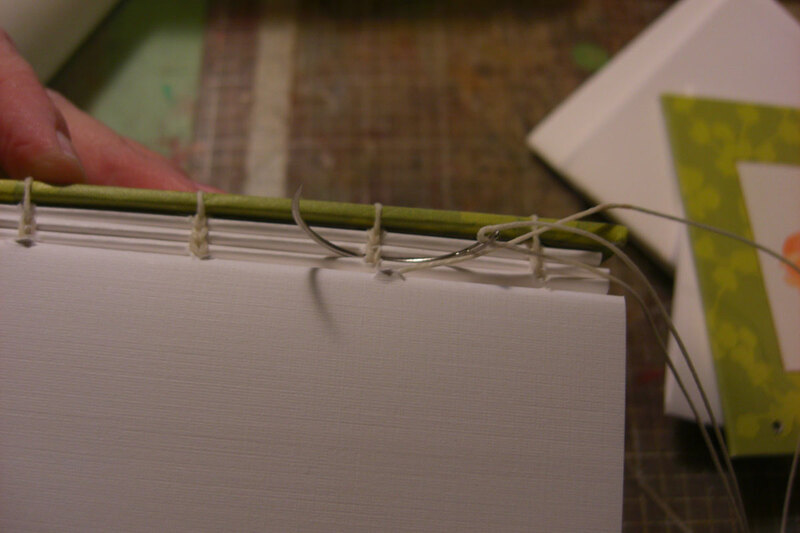 I own several books with sewn methods shown, most of them show this stitched binding. For this book size, cut 28 pieces of paper 4 1/4″ x 8 1/4″. I used a paper thicker than 20# printer paper, use whatever paper you like. I have used 90# and 140# watercolor paper. Colored papers such as Canson work well. Cut 2 thick cardboards 1/8″ larger all around, to 4 3/8″ x 4 3/8″. Davey Board is very stiff and dense and not the easiest to cut or punch but is the accepted board for book binding, you might try a thinner board for your first book. Some cardboard will work but is not archival and may disintegrate in your grandchildren’s hands in 50 years! 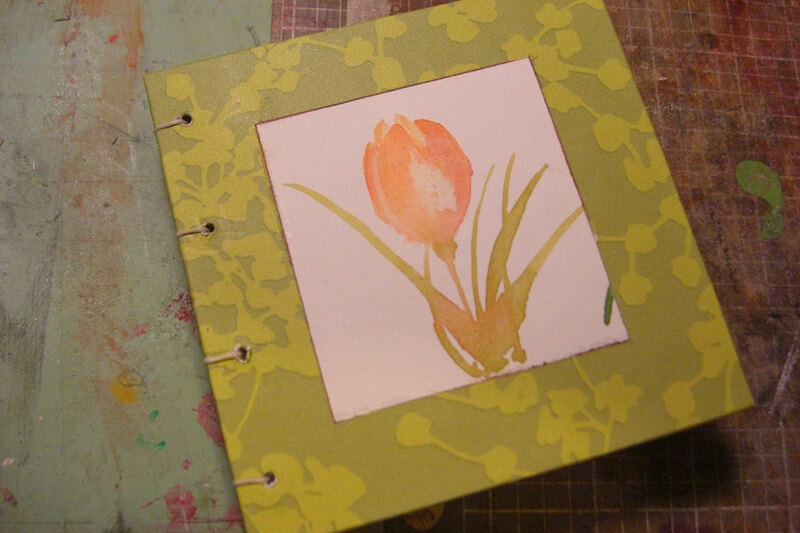 Cut 2 sheets of your chosen cover paper to 6″ x 6″. 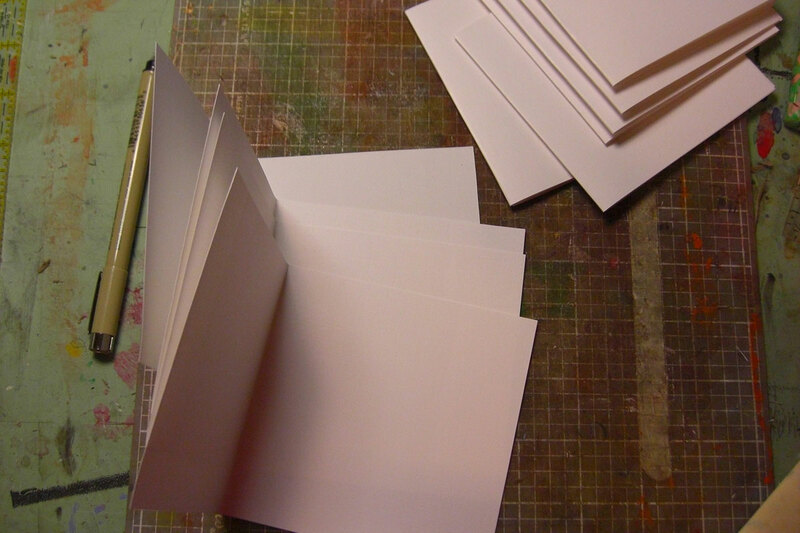 Cut 2 sheets of another decorative paper (for inside the cover, you will see it in the final book) to 4 1/8″ x 4 1/8″. Take 4 sheets of the 28 (more if your paper is thinner, less if it is thicker. I would only use 2 sheets for thicker watercolor paper) and stack together, then fold them in half all at once. A bone folder makes this easier work. If you don’t have a bone folder, use the handle side of a pair of scissors. These sheets make a signature. You will have 7 signatures. Take a scrap sheet of paper that is 4 1/4″ high, width is not important but you will fold it in half so you want it at least 2″ wide. 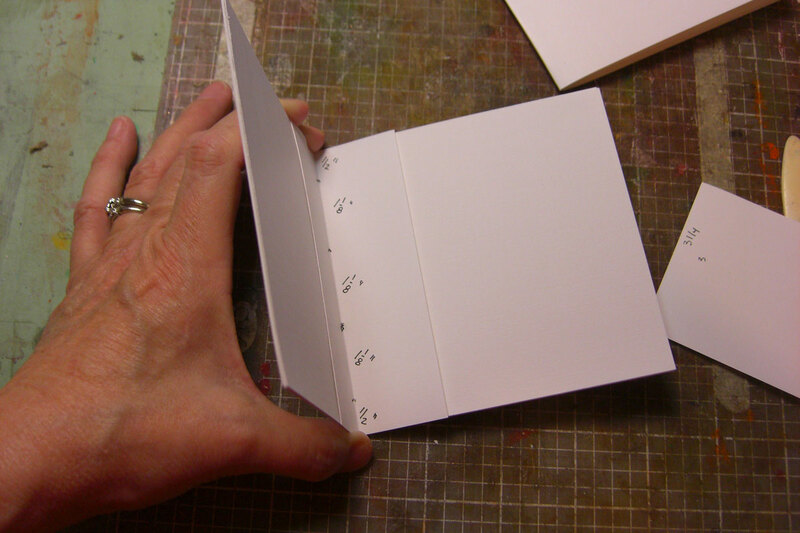 Fold this paper in half so that it is still 4 1/4″ high and 1″ wide (or whatever). Make 4 equal distance holes in the fold of this piece of paper. This will be your template for the holes in the signatures. Placing the template inside the folded signatures, use an awl to punch holes though all the sheets of the signature. Make holds in the cover boards to align with the holes on the template, centering the holes (remember the cover boards are a little larger than the signatures) and place them about 1/4″ from the edge of the board. I used an awl to start the holes and a screw hole punch with a small nib to finish them. Working quickly, brush glue all over the face of the cover boards and place them, glue side down on the back side of your cover paper, centering them by sight. Smooth flat. 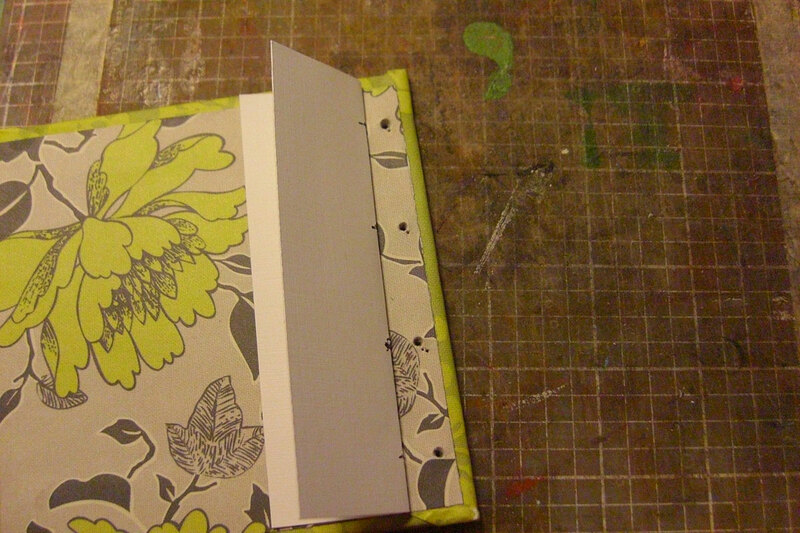 Cut the corners off the cover paper at an angle, about1/4″ from the corner. 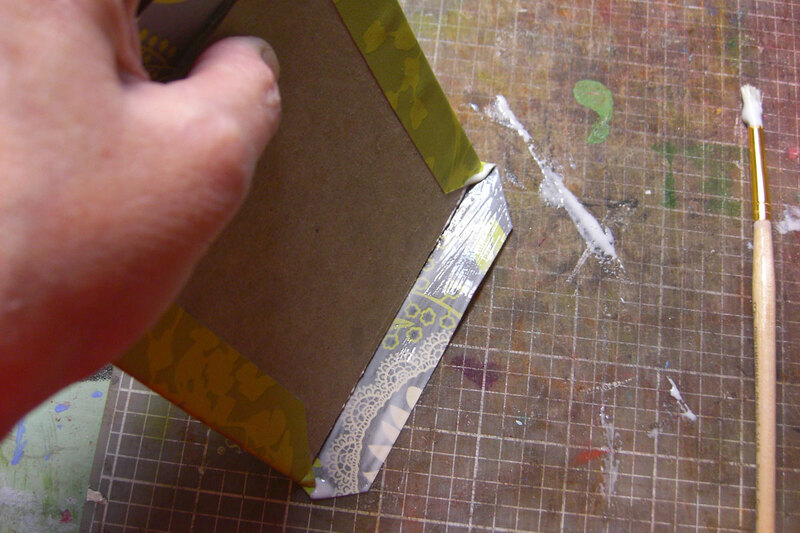 Put glue on the flap and fold over to the other side of the cover board manipulating the extra 1/4″ to cover the edge and give a clean look. Brush glue on the inside cover sheet and center on the board covering all the flaps. Smooth flat. Using your fingers feel for the holes that you have covered up on the cover boards and punch through the decorative papers. Now comes the hard part to explain, the sewing of the signatures. Cut a piece of floss to about 48″ (use a waxed bookbinding thread, or dental floss, or a strong jute thread or whatever you find that works). Thread a tapestry needle or a curved needle. Curved needles can be helpful in the stitching. Open up the signature and sew through the top hole. If you have printed pages, this is the last signature before the back cover. If they are all the same, it doesn’t matter which signature you add. Sew through the top hole of the back cover back to front. Loop over the end of the cover and sew back into the top hold of the signature and tie a knot to the end of the thread. This knot is on the inside of the signature. While still on the inside of the signature, sew through the next hole and then through the cover, back to front as in the first hole. Loop back over into the same hole (2nd hole this time) in the signature and then move to the third hole doing the same. When you get to the last hole and you have sewn through the cover, instead of going into the last hole of this signature, add another signature and sew through that instead. You will jump over one signature and sew outside to inside of the added signature. Move to the next hole and sew through it. Now your thread is on the outside of the book and you want to loop between the first signature and back cover (no hole to go through this time). Put the needle back into the hole in the added signature. 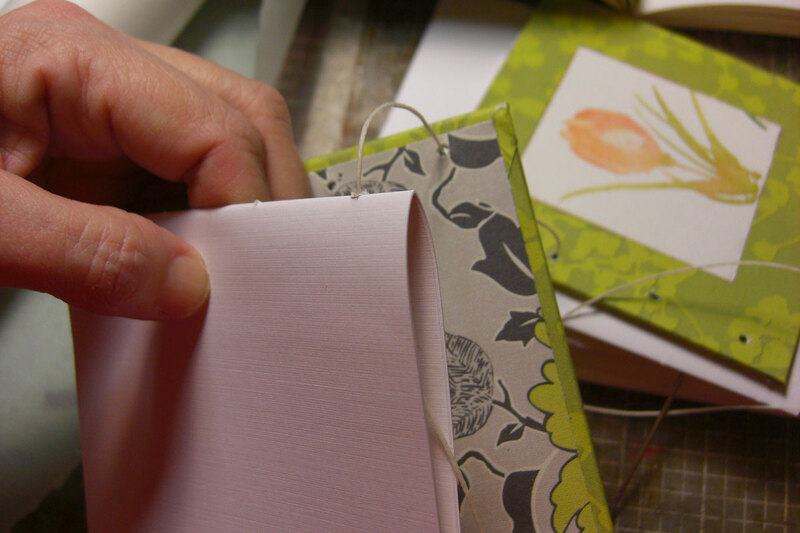 This creates a chain stitch on the spine of the book. When you add signature to signature, you will go between the two signatures rather than signature/cover. See the photo below. Continue to do this until you have added the front cover which is done the same way as the back cover. Note the middle holes look like a chain but the top and bottom holes don’t. Not sure how professional book binders deal with this. Those top and bottom holes don’t look as neat as some I have seen… Sew the last hole of the front cover and back into the last added signature and tie off. Cut the tread leaving a little tail and you have a finished book! Congratulations! 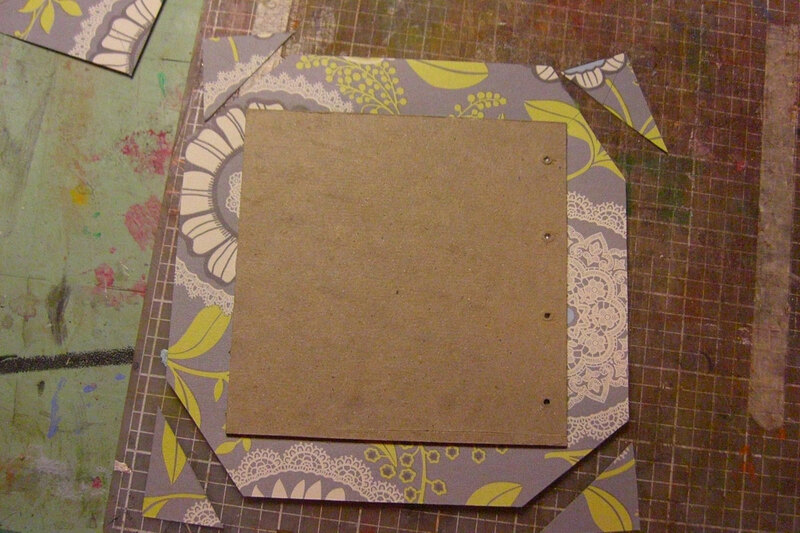 Put larger scrap paper under your pieces when you glue. This way you can brush glue off the paper 0r board to cover completely and then remove the paper for a clean surface. Keep the thread taut, as taut as you can without ripping the paper. 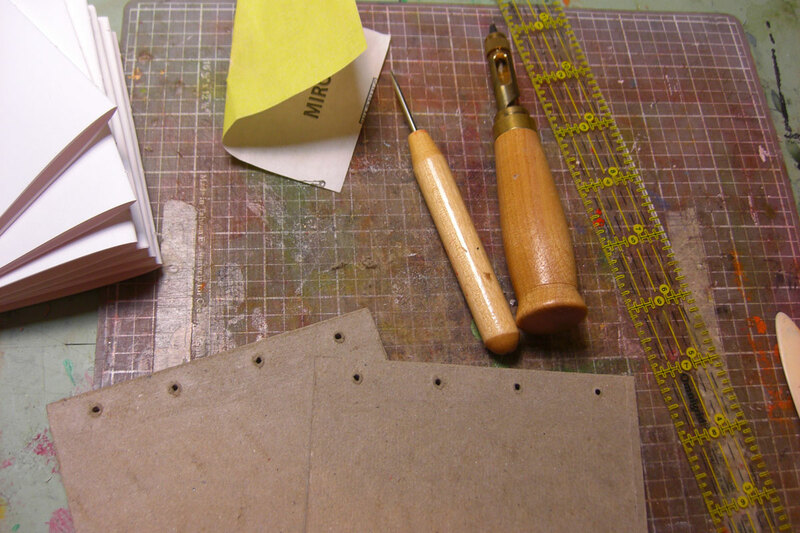 Use a brayer if you have one, to make sure the paper is glued firmly to the boards. Add a decorative or color sheet of paper to the outside of each signature for a fun touch. If you want to use printed sheets of paper, use Photoshop or another similar program to arrange your text or pictures and print before you cut your signatures sheets to size. You will have to put thought into it if you want to print front and back sides and keep them in readable order. Use an emory board or sand paper to smooth the cover boards after cutting or punching. Use cloth instead of paper for the covers but rather than gluing them (glue will go through the cloth), use a fusible bonding web with a backing paper that you iron on. Get creative with the cover. Sewing the book can be tricky, but once you do it, it becomes clear and makes sense. The weight of the paper is usually marked on the packaging if you aren’t familiar with paper. I use (and love) a PVC permanent adhesive glue by Lineco. It dries fast and is archival. The closer the top and bottom holes are to the top and bottom edges of the book, the more stable the book will be. Good luck, Victoria. Send me a picture of your book! I finished one of the books using my embroidery from a couple of post ago. Thought I would share it with you. I am anxious to create something tonight. Still debating what. Girls like tools, too. I, for one, love my sewing machine. It uses power and has sharp moving parts. As much a tool as anything my husband has. After years of sewing on Singers and even working at a Singer store during college, I bought myself a Bernina. Even after 6 or 7 years, it is so wonderful to sew on, no problems like I always had with Singer. Sewing can be fairly boring, but if you drop the feed dogs and start stitching while you control the position of the fabric with your hands, then sewing can be your paint brush and becomes so very much fun. I went the the American Arts Council Craft show at the Galleria over the weekend. There were so many wonderful artists there. One artist, Natalia Margulis, worked with free hand machine embroidery that was simply fabulous. I wish I could have afforded to buy one of her pieces (and about 100 other artist’s pieces). But, I found her website so we can see her creations. I think this is the best use of the internet. Looking at art. I came home and tried free hand machine embroidery. I had some beginner’s luck and did the tree on the book cover first. It was the best I did. I did the bird next (which actually looks better in person than in the photo) and the house last. The bird and house are done on water soluble stabilizer. It dissolves after you have stitched on it which leaves only the thread. The book’s cover is done on linen making it a little more stable. I had better control of the stitch, that’s why you get a bigger picture. If you look thru the book you see the next with tiny eggs in it. The eggs are about 1/4″ wide. The book binding has tapes, I have never done that before and looking at the book, it is obvious. It might go to Jasper for their upcoming Birdhouse auction but I may be too late. They said to be creative in my interpretation of a birdhouse. There were over 200 artists there. A lot to be inspired by. So, when do you know enough is enough? Wouldn’t it be nice if there were a little bell that goes off when something is done to the best of your ability? After taking out many stitches, I declare these done. More embroidery for covers of small empty books. I desperately want to do more to the bottom image but I think it is more expressive as is. Now, off to cut paper for the pages inside. I did the ginkgo leaf book. Now I am thinking thistle. Speaking of thistles, my mother, Julia Evatt, did the most beautiful little beaded thistle recently. Unfortunately, it did not make it into my greedy little hands so I cannot show it to you. But, I do have a picture of her beading handiwork, a bracelet she made for a swap on a beading cruise she took last month. The little faces are all her designs. I think she rightly impressed her fellow beaders! If, like me, you have a sporadic desire to embroider, there is a great blog here that demonstrates more stitches than I knew existed. Ever hear of the “twisted fly stitch”? Whilst waiting for the desire to paint to return, I am looking at other ways tokeep my fingers occupied. Last night I made this little book. 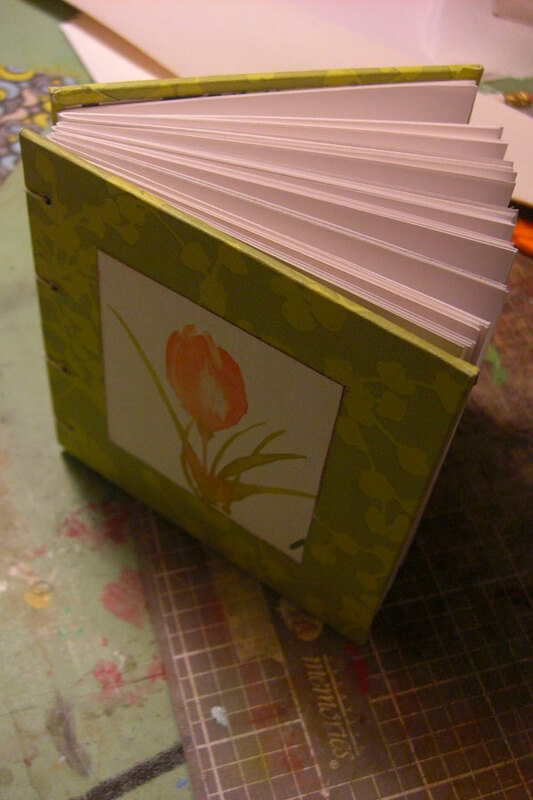 It is only a little over 2″ square and has 72 very blank pages in it. I photographed it next to my architect’s scale for scale. It was not suppose to have a fastener to hold it shut but the weight of the cover is not enough to keep it closed as you can see from the last picture. Lay it down and it just flops open. The leaf is embroidered on linen. Think I will make another with a ginko leaf. Speaking of linen, I never told you what my romantic husband gave me for Valentine’s Day. He bought me a whole roll of oil primed Belgium Linen at a very low price from Pearl’s who has sadly gone out of business. Not only do I need to start painting, I need to break out the oils and find some faces to paint. Maybe my desire to paint is intertwined with lack of time to paint. I have had architectural work lately which is keeping me out of the studio. Good to have work, I am hoping it is a sign that the economy is starting to turn. So here is a question for you. A final Jeopardy question recently was about a late 19th or early 20th century painting by someone whose name I cannot remember. It was a blank white canvas, just like when you are a kid and say of a blank sheet, it is a white rabbit in a snow storm. Anyone know who the artist was and what the painting is? I can find a painting of a white sheet of paper on a white background but I don’t think this is the painting. BTW, the “question” was “what is white on white” (or something similar). The contestants were all incorrect, but I got it right! 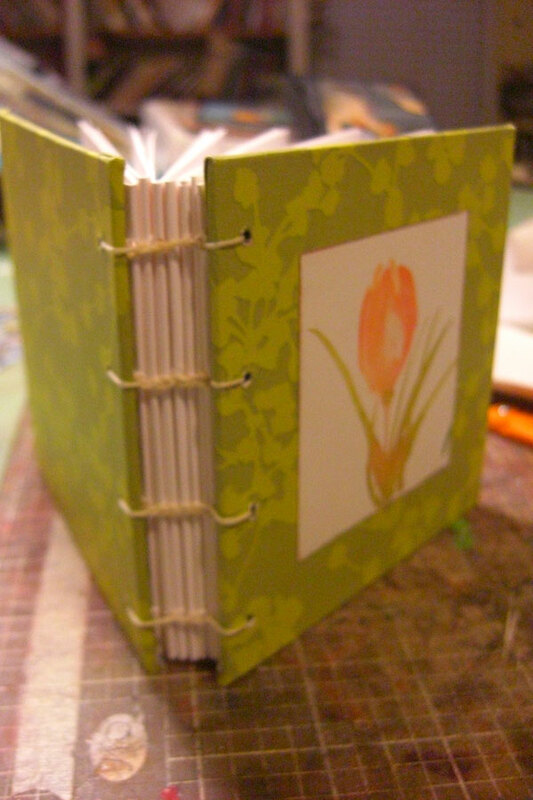 Several years ago I took a course in bookbinding and found it to be a most gratifying pasttime except I could only create books with blank sheets. Then I found out my printer accepted and printed beautifully on Rives printmaking paper. I started experimenting with Photoshop and old photos and printing them on the rather thick paper. Finally, content for my books! I took some photographs my grandfather, T.J. Eubanks had made of his family and created a book for my grandmother and then one for my mother and one for me. Only I never finished mine and the unsewn pages sat on the shelf until today. Today I decided to finish it. The covers have a photo of my grandfather’s father behind a piece of glassine paper and is framed with a handprinted paper I found in an art store in Athens (Georgia, not Greece). The signatures are sewn together with a chain stitch in waxed black thread. If you are unfamiliar with bookbinding, a signature is the grouping of papers sewn together into the book. I love the way this creates an open spine and how it shows off the stiches. I am very proud to be the granddaughter of T.J. He had a passion for photography. My favorite story to tell of him is that he devoted a room in his home to be his darkroom to develop his pictures. Mind you, he had a wife and eight children in this five room house. I don’t doubt my grandmother could think of many other uses for the room, but I am not sure she had much choice in the matter. Here is the now completed book. The overall size is 4 1/2″ wide x 5 3/4″ high.